Who cares if conferences play 8 or 9 games? Just win, baby! 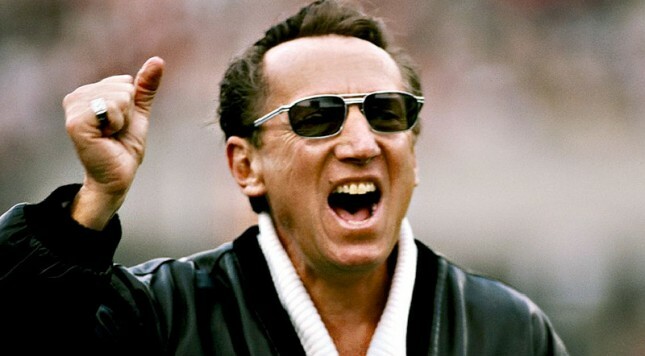 The late Al Davis was quite the visionary in the world of football. Although his management of the Oakland Raiders would come into question over time, there was one simple philosophy he lived by that is as timeless as any. The ACC will stay put with an eight-game conference schedule in the coming years, it was announced on Monday. The conference will provide an even number of home and away conference games for each conference member but require each school to schedule an opponent from one of the other so-called power conferences — the Big 12, Big Ten, Pac-12 or SEC. This is the same scheduling philosophy recently adopted by the SEC. The ACC already has a scheduling arrangement with Notre Dame and games against the Irish will count toward fulfilling the non-conference scheduling philosophy. Fortunately for the ACC, every school in the conference has a good track record of being able to meet the non-scheduling requirement, thanks in part to a handful of existing annual non-conference rivalry games with schools from the SEC. As we have come to see, there is no symmetry on the scheduling philosophies between the power conferences as we enter the College Football Playoff era. This puts the selection committee to task to take different variables and fit them together in an equation that yields four playoff teams at the end of the season. No matter of a conference plays eight conference games or nine, or whether or not the conference holds a conference championship game, the selection committee will have plenty of differences to sort through while determining which schools have the best résumés. The ACC will play eight conference games and require members to schedule one opponent from the Big 12, Big Ten, Pac-12 or SEC. Notre Dame appears on a rotating schedule among ACC members and fulfills the requirement. A championship game will continue to be held. The Big 12, a 10-member conference, will not play a conference championship game but will play a nine-game conference schedule so every school faces the entire conference. There is no non-conference scheduling requirement at this time. The Big Ten will expand from an eight-game conference schedule to nine games starting in 2016. A conference championship game will continue to be held and despite previous comments and reports, there is no requirement to avoid scheduling FCS opponents or teams from the MAC etc. The Pac-12 will play a nine-game conference schedule, but there is no non-conference scheduling requirement. The Pac-12 previously backed out of a previous agreement with the Big Ten for a conference-wide non-conference scheduling agreement. The conference will continue to hold a conference championship game. The ACC and SEC are playing on the same ground rules, but the Big 12, Big Ten and Pac-12 are going by their own individual sets of rules, and that is OK. Conferences should do what is best for their individual members and not feel pressured to fall in line with what another conference is doing. At its core, that is the point of a conference anyway, is it not? In the end it will not matter of conferences are playing eight games or nine or holding a conference championship game or not. All that will matter will be winning 11, 12 or 13 games a season to get a chance to crack the playoffs. Nobody knows just how the selection committee is going to come up with four teams but one thing that is almost guaranteed is a team winning 11, 12 or 13 games is going to have a much better chance of getting one of the four spots available. So the focus should not be on how many conference games a team is playing. Instead, it should be about putting together the best team possible and going out and playing its best week after week. A lot is changing in college football, but the one constant that seems to be in play here is the need to go out and just win.